The 350 HO is based on a tough, Chevy four-bolt crate engine block that holds a strong nodular iron crankshaft, good rods, and aluminum pistons. The high-lift camshaft gives the engine its own unique, aggressive idle. The cam is based on the same one found in 1965-67 Corvette 327 engines, but it has even more lift and duration. 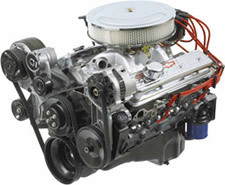 Complete from top to bottom, the 350 HO comes pre-assembled with the intake manifold, carburetor, water pump, and distributor. With the Turn-Key trim level, you also get everything you need for a complete, running engine right out of the crate. We ship it with an accessory drive package, fuel pump, starter, and spark plug wires included in the package (not installed). The 350 HO Turn-Key Chevy crate engine offers you an incredible performance value—all you need to do is add the fuel and enjoy!